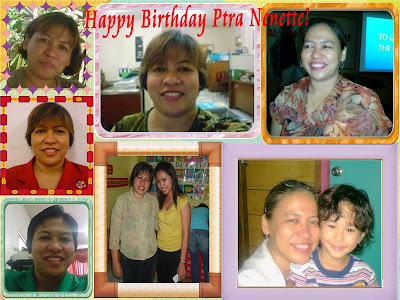 LOVE's Haven: HapPy Belated Birthday Ptra Nenette! Just wanna say Happy, Happy Birthday to you our dear Ptra! Wishing you ALL what God has instore for you! When everything seems to go wrong, Just P.U.S.H.! When the job gets you down, Just P.U.S.H.! When people don’t react the way you think they should, Just P.U.S.H.! When giving is low and the bills are due, Just P.U.S.H.! When people don’t understand you, Just P.U.S.H.! Pastora Nenette, thanks for being so "pushy"! once again...belated Happy Birthday and God Bless you more!